Imidacloprid – a type of neonicotinoid – changes the way that worker bees interact with the colony’s larvae: they become less social, stop nursing larvae, experience altered social and spatial dynamics within nests, and cease hive insulation construction. While there are many studies which speak to the links between neonics and colony collapse, there are many others that decry this science as a “myth.” There will be yet another onslaught of those who say that that correlation is not causation, in response to the proposition that neonics – or imidacloprid at the very least – have a direct effect upon social behaviours that result in the loss of larvae. 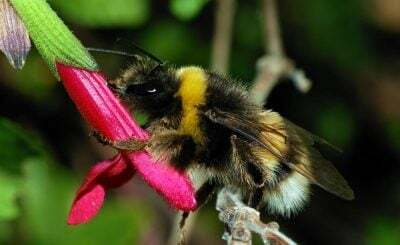 The end result is the decline of bee populations but also – since bombus play key roles in the food chain acting as pollinators in temperate ecosystems – many other species have declined across Europe and North America. In line with some of last fall’s scientific revelations, citizen scientists are coming to the rescue, developing apps to record bumble bee sightings and upload pertinent information such as habitat type, location of sighting, and weather. This information will then be shared with researchers who can analyze the submissions and chart out migration patterns.